In the spring of 1703, on May 16th, on the day of the Holy Spirit, the construction of the fortress on the Zayachy Island began. Legend has it that when the first ditch was ready, Peter I took a stone box containing a gold ark with particles of the holy remains of Saint Andrew the First Called, and put it into the ditch. Then he cut two slender birch-trees, tied their crowns together and put the trunks into holes dug in the ground. The birch-trees marked the place where the gates of the future fortress were supposed to be. At that moment an eagle flying over the island came down and perched on the birch-trees. Peter, who saw it as a good omen, ordered to catch the eagle. He tied a kerchief around its legs and, holding the eagle in his hand, boarded a yacht and sailed off to the sounds of gun salute. Peter named the fortress after his heavenly patron Apostle Peter. At first the name was pronounced in the Dutch manner – Sanct-Peterburh but was eventually changed into Sanct-Peterburg and remained such until the early 20th century. Construction of the fortress proceeded smoothly and took just four months to complete. A rampart and bastions protected it from the outside. Inside a church was laid in honor of Apostles Peter and Paul. 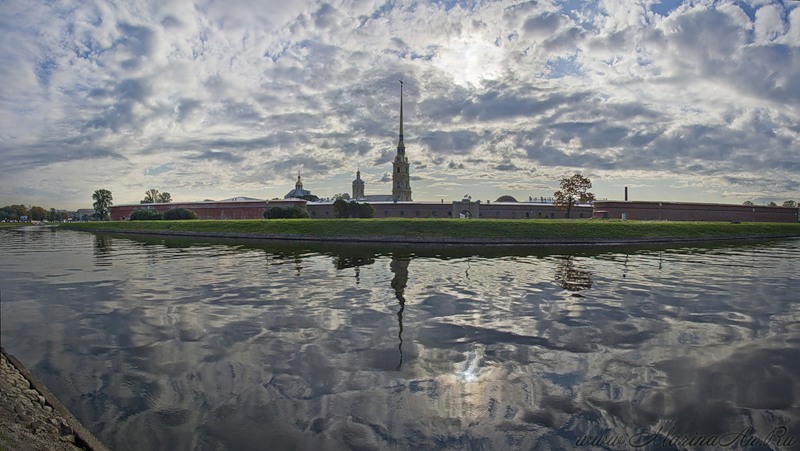 The church came to be known as Petropavlovskaya and so did the fortress, while the city springing fast around it took the fortress’s initial name – St.Petersburg. August 1703 saw a landmark event for St.Petersburg as a future seaport: the first merchant ship from Holland dropped anchor in St.Petersburg’s harbor. It brought salt and wine. Peter, overjoyed, bid his guests a rousing welcome and lavished them with gifts. He realized how desperately the city needed a port and ordered to speed up its construction. Up to 20 thousand workers from all over Russia St.Petersburg. Admiraltywere brought in annually. Working in shifts for two months in terribly hard conditions, they were building the city. Things were complicated by a swampy soil and frequent floods, and the workers did all they could to save the fruits of their labor. They built embankments and dug drain canals. As the Swedes were still hoping to recapture the area, Peter built a naval fort on the island of Kotlin just where the Neva emptied into the sea. The Kronslot fort, which eventually turned into a powerful sea fortress Kronstadt, had an enormous part to play in defending the naval approaches to the city. Peter instructed the fort’s commandant to maintain everything in strict order and fire warning shots as a signal for passing neutral ships to lower the sails and drop anchor, and in case they disobey, to open attack fire. Now that Russia had an outlet to sea, it was only natural that it should have a navy. Peter used his architectural and engineering genius to design a shipyard. Construction began on November 5, 1704, and in just a year the Admiralty Shipyard, the cradle of the Russian Navy, was put into service. In the first quarter of the 18th century it accounted for half of all Russian battleships, 23 out of the 48. The ships had excellent combat characteristics, they were fast and maneuverable, a fact that even Russia’s enemies dared not deny. The Russian influence in the Baltic was rapidly increasing.